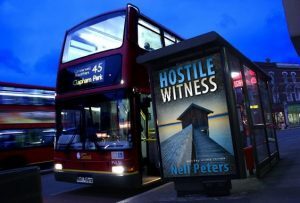 Somehow we’ve reached the end of another month, so I’m handing over my site to the lovely Anne Polhill Walton- aka crime writer- Nell Peters. Once again Nell has provided a brilliant blog- although a certain Mr Connery may not think so…you’ll see what I mean! With four sons, I was unable to avoid all the Indiana Jones films – did I really read recently they are making another? Seriously? Harrison Ford is well into his seventies and his on-screen father, Sean Connery, is more than ten years older than that! They’ll surely be cavorting around, wronging rights from their bath chairs? Probably pushed around by scantily-clad beauties, though, as Hollywood OAPs are somewhat more attractive than the common or garden variety – they perhaps don’t need their Winter Fuel Allowance either, in sunny California. There is a Connery connection to Jenny – not Sean, but his nipper Jason (he of the long, flowing locks), who played the eponymous role in the last of the Robin of Sherwood TV series many years ago. Where does the Jenny link come in, I hear you ask – go on, please ask, or I’ll have to think of something else to prattle on about (imagine a sad, pleading face here – oh, and violins playing). Well, Jen has had a bit of a thing about Robin Hood since she was a wee gel – one of her books is even entitled Romancing Robin Hood (and a sequel is brewing) – you don’t get much more dedicated than that. After a gap of thirty years, surviving members of the original TV cast have reprised their roles in The Knights of the Apocalypse – an audio drama crowdfunded by fans. We could speculate that they went for an audio production because there simply wouldn’t be enough Polyfilla available for the cast to appear recognisably on screen, but that would be cruel. I have seen a pic of Jason C, however – gravity has taken effect with a vengeance and his only hair now is sprouting from his chin. Whatever … while our ardent groupie Madam Kane managed to blag a ticket and hobnob with the stars at the premier performance (I’ve seen those pics too! ), for me the best thing is that the production company is called Spiteful Puppet – genius name! 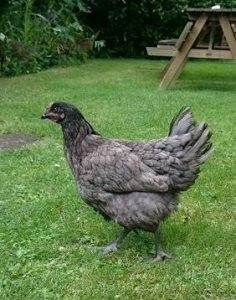 Svet is a magnificent Bluebell hen – her plumage has a definite blue hue in a certain light, and she was sixteen weeks old when she moved in. She is bigger than Pav with feet large enough to support a strapping 25 lb turkey, perhaps even a Pterodactyl. #4 lives more rurally than us and he chose Svet from a farm local to him, where numerous birds were housed in a large pen with a sandy floor. She was picked up on BBQ day and transported to her slightly more glamorous life – a third of an acre with grass underfoot – on the back seat, just as carefully strapped in as the GDs. Pavlova was doing one of her nesting stints when Svetlana arrived and so they didn’t meet until the next morning, when Pav came to feed – she was a little put out, but feathers didn’t actually fly and since then, while not yet bosom (or chicken breast) buddies, peace has been declared and there is no battle of the beaks to rule the roost. They really couldn’t be more different in personality (yes, they do have personalities!) – while Pav is quite skittish and aloof, rather like a cat who tolerates our presence as long as we know our place and keep her well fed, Svet is really laid back and friendly and follows us around like an adoring puppy. She doesn’t even mind the Grands chasing her and also talks incessantly (which the old chick on the block has never done, apart from very loud crowing when she thinks it’s chow time) making sort of mewling noises, rather like a Moomin with feathers. Finally, I have reached the conclusion that the OH has been around my warped sense of humour for way too long and has lost his immunity. When no one was looking, he retrieved one of those Nando’s chicken on a stick things (liberated from the restaurant years ago by one of the boys) and stuck it in the grass by the communal food receptacle. Really! 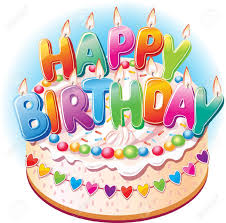 OK, that was my original post for Jenny, written a couple of weeks in advance. I’m so very sad to report that both Pavlova and Svetlana have since been killed – most likely suspect a cat new to the neighbourhood, that I’ve spotted in the garden at all hours of the day and night. I know this is a first world problem – that there is dreadful carnage and unimaginable human suffering globally, to which the loss of two spoiled chickens cannot possibly compare, but I do so miss them. For instance, there is no one to greet me when I take an early morning stroll in the garden – they’d spot me a mile off and speed toward me with their silly run-trot, Pavlova making the most unholy din. Of course, I realise they were after food and not my scintillating conversation, but they always made me smile. 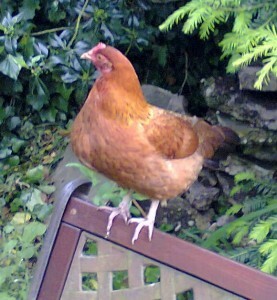 And Svetlana, being a cheeky young upstart, had taken to sitting on the back door mat if the door was open, a few yards away from me when I was using my lap top at the table – just hanging out. 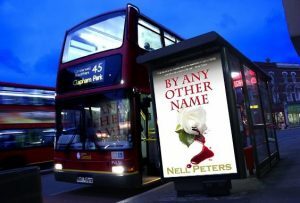 Nell Peters writes psychological crime novels and is published by Accent Press. Her next protagonist is going to be a chicken. Devastated about Jason C…I know I am possibly old enough to be his mum but I did rather fancy him as Robin too. I also fancied Roger Moore when he was Ivanhoe but soon got over that. Sad about the chickens, killer cat on the loose? 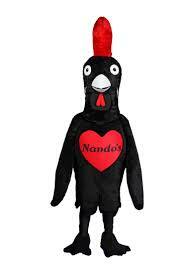 Just goes to show all things must pass and that includs youth, good looks and even spring chickens meet their end. Keep it up ladies. Fun to read.